Buy 2 quarter-sheets of the same color and save $92. Buy 4 quarter-sheets of the same color and save $242. 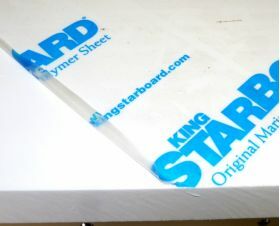 King Starboard is a marine-grade polymer, which means it's a high-tech plastic that will stand up to salt water and sun a lot better than most types of wood--without a lick of maintenance, and often at lower cost. 3/4" thick King Starboard is what we use for the tops of our own fish-cleaning tables (supported underneath with a couple lengths of hefty aluminum "U" channel). And it also goes into the frames of our stock and custom-design boat doors. This thickness is also peace-of-mind dandy as backing blocks for lifeline stanchions and other fairly high-load deck hardware. So long as it's supported by solid frame members around 12" - 14" apart, 3/4" Starboard can handle a fairly heavy load with no problem -- including swim-platform applications.